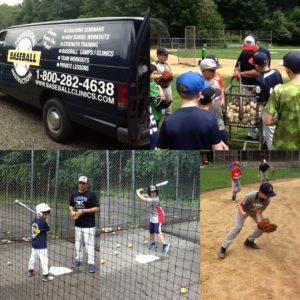 Professional Baseball Instruction‘s “floating” hitting/fielding & pitching clinics are designed for players between the ages of 7 and 12 and allow you to design your own clinic program around your schedule. Fall is busy enough with kids getting back to school and everyone settling into a post-summer routine. You choose one day per week for each of the four weeks. The hitting portion of the program covers intermediate to advanced skills including swing plane, lower and upper body mechanics training, and leading up to advanced skills of hitting for power and hitting the count. We use various training devices to continue to cultivate a solid fundamental hitting base. We also perform innovative drills to increase your chances of hitting the ball on the “sweet spot” consistently. Our hitting stations, when performed properly, create positive muscle memory, effectively replacing poor habits with good habits. Live hitting is also part of the program. Base running work will complete the offensive training portion of the program. Our hitting program has been designed with the help of Pittsburgh Pirates Manager Clint Hurdle and has been recognized as 5 STAR by former San Francisco Giants Manager Felipe Alou. As for the fielding portion of the program students will learn and sharpen basic fielding fundamentals and then move onto more intermediate and advanced skill-work, including backhand drills, forehand drills, short hops, long hops, double plays, making tags; they will also learn how to consistently field “thru the ball” which is vital to being a solid infielder. Outfield ground balls, fly balls, and getting the proper approach to the ball will also be covered. All students will make numerous throws from basic fielding positions and off-balance. Our step-by-step approach will have your child ready to play with confidence at the next level. Minnesota Twins infield instructor Sam Perlozzo and former Major League short stop Mike Aviles constantly keep PBI on the cutting edge of training for fielders. PBI develops solid fundamental pitching mechanics and improves strike-to-ball ratios through specific training drills. Pitching mechanics are worked on at every training session through our “building blocks” program that has developed top-level youth pitchers. Pitchers are educated to the mechanics and how they relate to each pitch. All pitchers WILL throw strikes. Pitching can be a complex theory and to help understanding, we break it down into simple-to-comprehend drills and teaching. All students will develop a thorough thought process of pitching and understand the responsibilities that are vital to pitching success. Students who are at a more advanced level will also learn and develop a change-up to complement their fastball. All pitchers will throw off of regulation Little League or 50/70 mounds, get charted, and have their pitches clocked with our radar gun. We will round out the program by working on fielding skills associated with pitching including bunts, cover 1B and come backers. PBI’s pitching programs are designed with the help of legendary Major League pitching coach Leo Mazzone.